Peu rigoureux, le récit passe de la chronique familiale vériste aux péripéties de série B confinant au ridicule. Pris séparément, les éléments du long métrage Kin sont intéressants. Mais, maillés les uns aux autres, ils forment un assemblage scénaristique malheureusement bancal. Still, it's all a little forgettable, and certainly, this will be the type of thing you forget all about once leaving the theater, even if it's a decent watch. 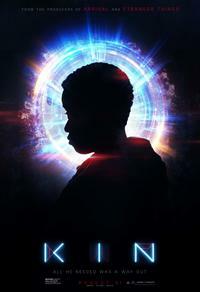 Again, this probably just isn't the right market for it, and there was a time when a decent sci-fi B-movie might have been ok theatrically, but given all the competition out there, KIN is too modest to survive. The material's promise isn't fully realized, but at the feature's strongest there's something exhilarating about its detour onto backroads, away from prefab superheroics. It shouldn't be a problem for those who do take a chance on Kin to not only fall into its rather unique universe, but to come out on the other side wanting to see what happens next. By the time Kin stumbles to its conclusion, moviegoers may want to do the same thing to the filmmakers. This debut feature from Jonathan and Josh Baker wants to launch a franchise, but it can't even juggle sci-fi with family drama. Fleeing bad guys is definitely easier with a ray gun in this road-trip thriller with a sci-fi twist.